The Midlands Air Ambulance Charity will be exhibiting their Airbus Helicopter H145 at the RAF Cosford Air Show this year’s Air Show. The Ukrainian Sukhoi Su-27 will display at RIAT for the third time in 3 years. Another will be on static as will a Ukrainian Il-76 transporter. As part of Swansea’s 50th anniversary celebrations there will be a dusk display from 8.30pm on Saturday, with hot air balloons, night-flying aerobatics and fireworks. A Leonardo Merlin HM2 Royal Navy airborne submarine hunter is the latest addition to the helicopter static display at the RAF Cosford Air Show. Westland Wasp HAS1 'XT420' will join the previously announced Navy Wessex for the opening flypast at the Royal Navy International Airshow. The Wasp will then display. 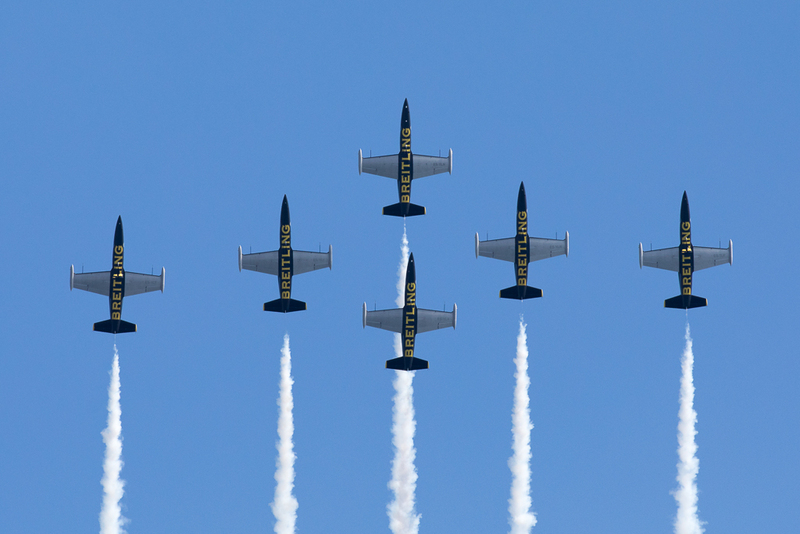 The 2019 display schedule for the Polish Air Force Aerobatic Team, 'Team Orlik' has been published. No UK displays have been listed. Paul Stone has taken over from Dodge Bailey as Chief Pilot at the Shuttleworth Collection. 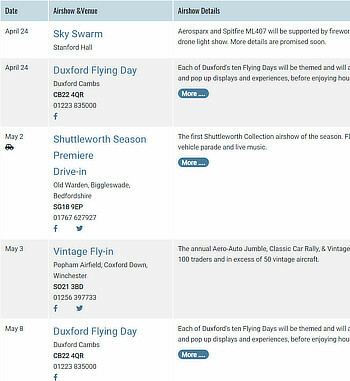 The Albatros, which had been billed to fly at this year's Shuttleworth Season Premiere, is no longer in the flying display list. Navy Wings have announced that their Sea Fury T20 has been added to the flying displays and the show has announced that an RAF Puma HC2 will be in the static displays at the RAF Cosford Airshow. A C-17A Globemaster III from the United States Air Force is the latest addition to the static displays at the Royal Navy International Airshow, Yeovilton. Hispano HA-1112-M4L Buchon "Yellow 7" (G-AWHM) is the latest addition to the flying schedule at this year's Flying Legends. Over 80 aircraft and 5 tethered balloons are due to appear at the Abingdon Air and Country Fair. 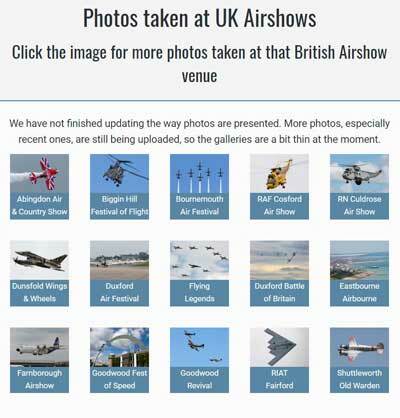 The RAF Typhoon Display Team have issued their 2019 display schedule, intitially via their social media. A pair of Fairchild Argus aircraft will be at the RAF Cosford Airshow as part of the ‘Women in Aviation’ theme, one flying and one static. The Finnish Air Force has published its display team schedules for 2019. They have listed their F-18 Hornet to display at RIAT but no other UK displays are scheduled for the F-18, the Midnight Hawks or the other Finnish Air Force teams. The Lithuanian and Slovak Air Forces will both send C-27J Transport aircraft for the static display at this year's RIAT. Headcorn's Battle of Britain Airshow have published their flying display programme for both Saturday and Sunday 6th & 7th July. Patrouille de France have listed RIAT as their only UK display in 2019. 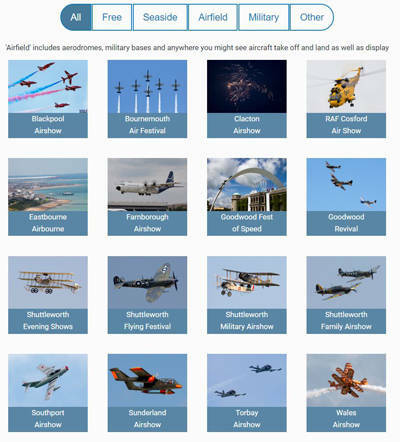 The Rafale Solo Display Team have published their calendar for the 2019 season. There are not currently any UK dates. 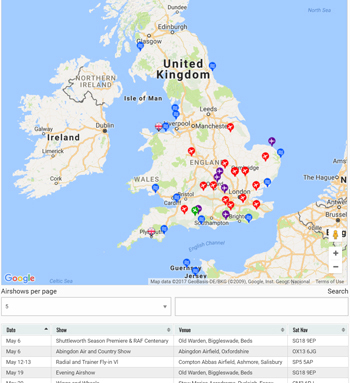 You can discover the ownership of UK aircraft and other registration information from the CAA information database. 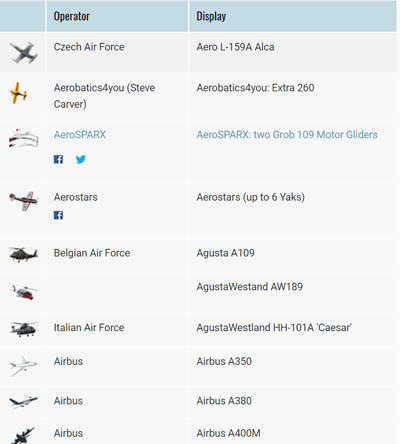 The Museum of Army Flying publish their daily movements on Twitter.